There are more than 2,000 listed companies on the ASX outside the top 200, and many investors have little exposure to this difficult to navigate area of the market. 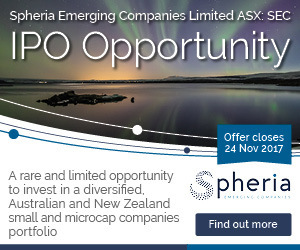 Spheria Emerging Companies Limited (ASX:SEC) is a new listed investment company from the small-cap specialist team at Spheria Asset Management. This LIC is only the fourth new listing to receive a ‘Highly Recommended’ rating from Lonsec. With no attached options, and the manager covering all costs, the company offers a new way to access a diversified portfolio of cash generating small-caps on the ASX. This limited offer has strict capacity constraints and will not be accepting oversubscriptions. Learn more by downloading the prospectus today.